Released news about actor Eric and Yoon KyunSang join cable tv TvN’s reality show “3 Meals A Day” has raised people’s attention. The expectation of what kind of image they will show in reality show is already high. 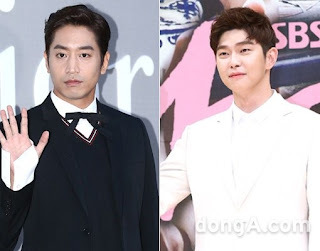 Eric and Yoon Kyungsang’s charms appear in TvN “Another Oh Hae-young” and SBS “Doctors”. Through “Another Oh Hae-young”, Eric who is an actor for 10 years revealed his acting skill with comic yet a serious charm at the same time. After Yoon KyunSang debut in 2012, with “Doctors” he becomes the hottest rookie in the spotlight.Through the small screen, PD Na Young-seok didn’t miss the chance that has in them. At October 14th, the first episode of “3 Meals A Day – Fishing Village” will aired with them as casts. Na PD’s opinion about Eric “his image that can change in many times (4D images) will suitable for the program” become the reason why he cast him. Eric’s 4D charm already known and famous among the fans. In 1998, with the other members, he made his debut in Shinhwa and living as a fun image group, it became a unique topic in internet community. Althought 3MAD-Fishing Village has not broadcast yet, people really have big expectation at his 4D charms. “Instead having a lot of pressure, I’ll try to get more comfortable in reality show” Eric said. Na PD didn’t hesitate to offer Yoon Kyunsang to join “3 Meals A Day”. Although he has less experience in entertainment programs, the vacation concept of 3MAD will make it fun and interested. And because there was no time to get a vacation after his debut, hope through this program he will enjoy his travelling time. Through SBS “Sic Flying Dragons” PD Na has been eyed on Yoon Kyunsang and get his information from the production team, ayear later, after the episodes of “Doctors” end, at the end of August Na PD finally approached him. “The entertainment industry will be freshed with the combination of Eric and rookie Yoon Kyunsang” “Eric with his 4D charms and Yoon Kyunsang’s seriousness will create a synergy that make high expectation” said the program’s production crew.